Yunnan steampots are found through most of south-central China, and they’re a wonder of simplicity. 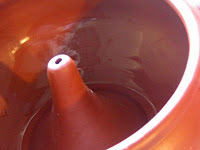 This kind of pot is made of smooth clay with a tight-fitting lid, and the bottom of the pot has a funnel-shaped opening that goes up the center of the pot. This pot is then filled part way with meats and or vegetables, seasonings, and broth, and then the pot is placed on top a kettle of boiling water, which allows the steam to torrent up through the funnel and into the pot, making more stock while cooking everything to perfection. None of the juices or aromas get a chance to escape this way. It’s utterly artless and yet utterly brilliant. 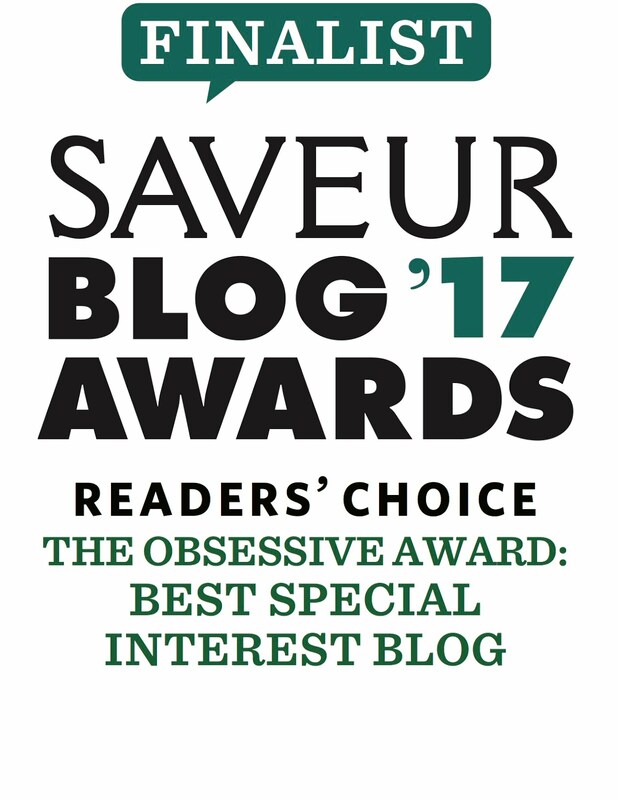 The clay is a lovely dark red, and they are so pretty that I have two at the top of my blog by the masthead. They come in around three sizes, so find one that fits your family. I got mine at the Wok Shop in San Francisco, where they can be mail ordered. Don't take the sizes (2 quart and 2.5 quart) too seriously. The one that I am using here is a 2-quart, and yet I could comfortably put only 6 cups in there. But, it's a good size for us and so far has worked like a dream. To select a steampot (assuming that you actually are going to walk into the store and poke around), the biggest deal is to check for chips and cracks. 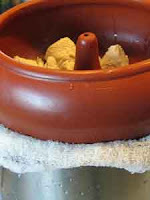 Chips will weaken the pot and also make it more difficult to close the lid tightly on the top. Cracks, of course, will only get worse, so reject anything with even a hairline fracture. When you're through with cooking in it, wash it out carefully by hand (rather than in a dishwasher), towel it dry, and then let it air dry completely before putting it away. Traditional recipes call for a very large steampot and a whole chicken, but I prefer to use just boned chicken or turkey breast in a smaller, 6-cup capacity steampot. I have also added wolfberries (also known as gouqi or goji berries) for their fruity sweetness, beautiful color, and added nutrition. 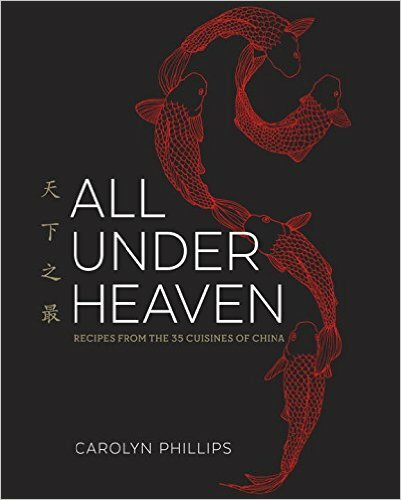 The other main ingredients are rice wine, fresh mushrooms, either water chestnuts or bamboo shoots, a few slices of Chinese-style ham, and a good chicken stock to round out the flavors. 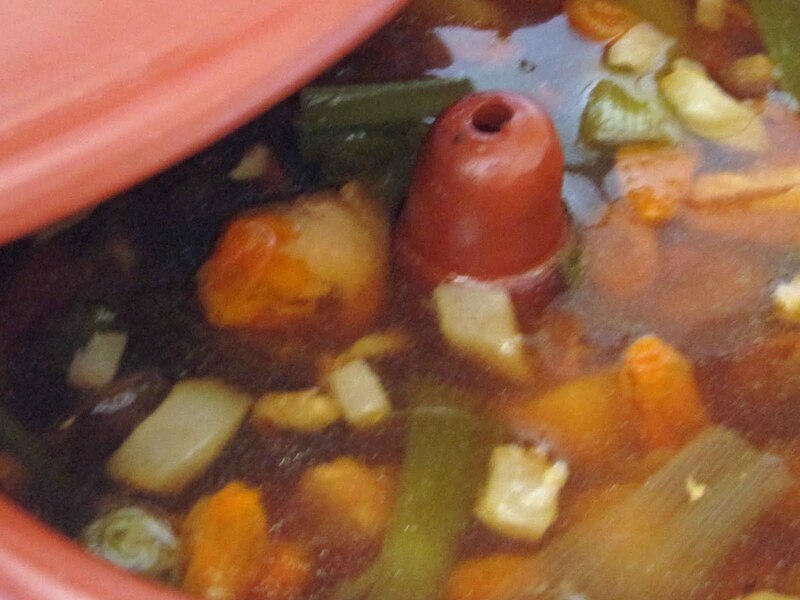 If you do not have a steampot handy, feel free to simmer the soup in a large sandpot or casserole, and add another cup or two of the stock since steam won't be plumping up your soup. Note that the main ingredients are all cut up into pieces that are approximately the same size: about 1-inch cubes. 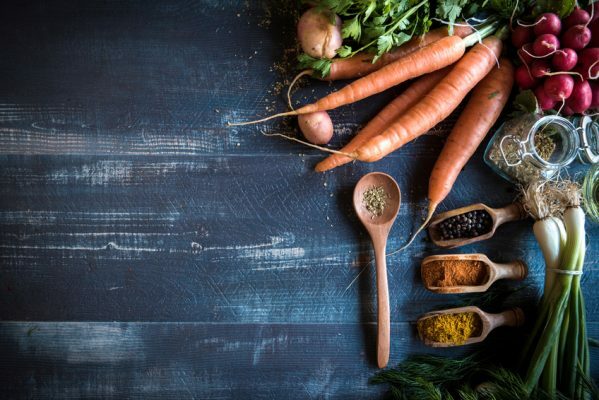 This gives the ingredients the chance to properly mingle with each other in the broth, and by the time they are fully cooked, they will have shrunk down in size a bit so that each spoonful of this tasty soup will yield a few different flavors. There also are a couple of sweet elements or options here - the water chestnuts, wolfberries, and rice wine being the main culprits - so if you use them, be sure the temper the rest of the ingredients so that the soup maintains a nice balance between sweet and savory. If in spite of your best efforts you find that it still has too sweet an edge, stir in a spoonful or so of apple vinegar at the end to sharped it up a bit. Please note that this dish can be easily halved if you are feeding fewer people or if you have a smaller-sized steam pot. 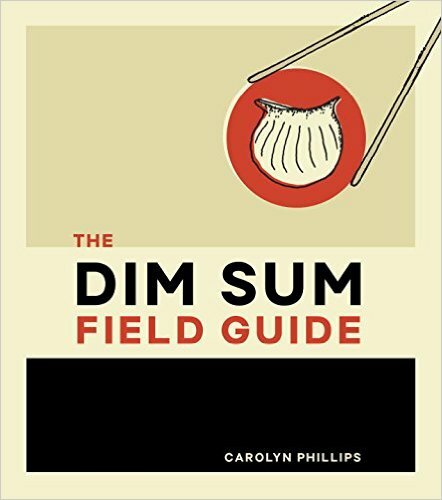 But no matter how much you make, all this dish requires is a good appetite, a bowl of rice or a few fried scallion breads, and maybe some stir-fried greens to round it out. 1. 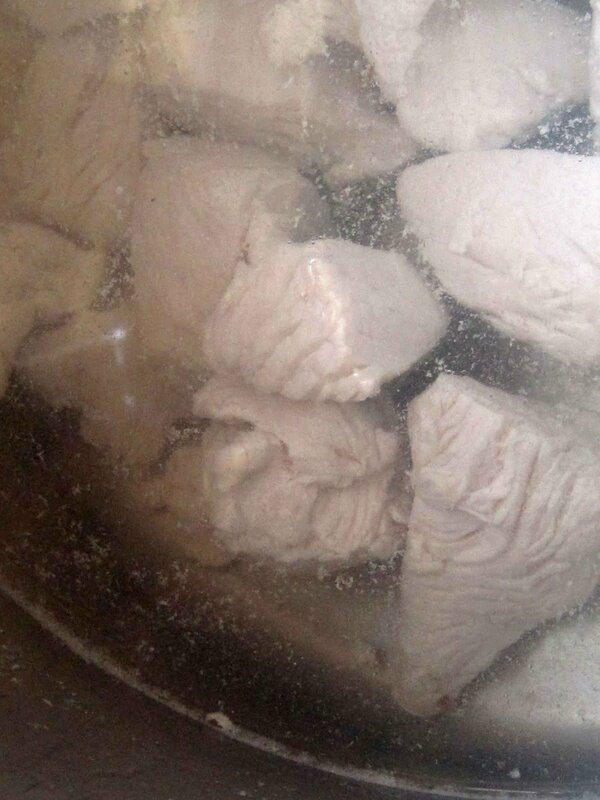 Rinse and pat dry the breasts, removing any silver skin (tendons) that run through them. Cut the poultry into 1-inch pieces. Bring the water to boil in a large saucepan, drop in the cubed breast meat, and stir so that none of the pieces stick together. Simmer for about 2 minutes to blanch them and remove any scum. Drain and discard the water, rinse the meat under running water, and allow it to drain. Rinse and dry the saucepan, and then fill it about halfway full with water before setting it on your stove. 2. Since you want to direct as much steam into the steampot as possible, line the top of the saucepan with a couple of strips of cheesecloth and lay the steampot firmly on top of the saucepan, pushing down slightly so that it is nestled in there tightly. 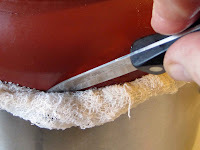 Bring the saucepan to a boil and cover the steampot; after a few minutes, check around the edge of the steampot for patches where the steam is coming up through the cheesecloth; use a paring knife to poke the cheesecloth into these holes. After a minute, check again, and you should have all of the steam directed straight into the pot where it belongs. 3. Cut the water chestnuts or bamboo shoot into 1-inch chunks. 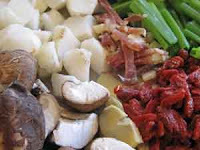 Then, place the blanched poultry pieces evenly in the steam pot and evenly layer the ham, winter chestnuts or bamboo shoots, mushrooms, ginger, scallions, wolfberries, and rice wine on top; grind some fresh black pepper over everything. 4. Set the steam pot on top of the saucepan, and then pour the hot stock and a bit of soy sauce on top, leaving at least an inch of the pot’s funnel showing so that the soup won’t boil over. Cover the steam pot, bring the water in the saucepan to a boil, lower the heat to medium, and let the soup steam for about two hours. Try not to open the lid too much while it's cooking so that the steam doesn't escape. When the soup is done, the water chestnuts will still be crisp, but everything else should be tender; taste the soup, adjusting the seasoning as necessary. Sprinkle on a bit of sesame oil and either some shredded scallions or cilantro. 5. Fold a towel into a square and place it on a large plate so that it can hold the steam pot steadily and you don’t burn your hands when you bring it to the table. 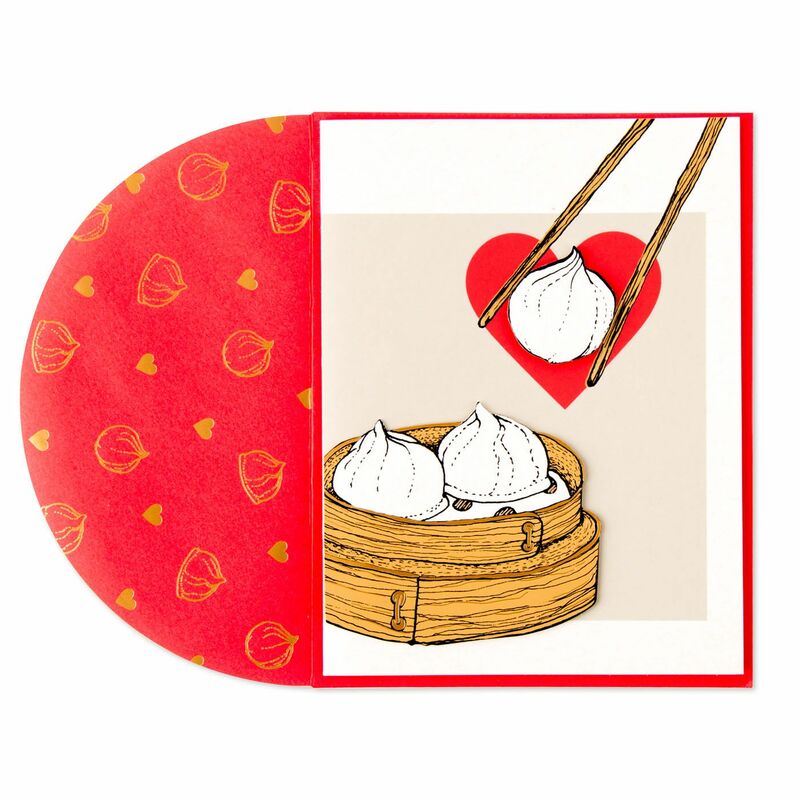 Use two potholders or a thick towel to remove the steam pot from the saucepan and place it on the folded towel before carrying it proudly to the dining table. Remove the lid with a flourish. I recently received one of these as a gift. Are you able to direct me as to what the symbols mean on the pot? I also have one, which I found markings on the inside of the lid. I'm guessing the name of the person who made it. Anyway you might be possible to read/translate it for me? Sure thing. Just send me a photo to the email listed above your comment.